Lately (indeed, constantly) I have been spending a lot of time on attempting to decipher ancient Semitic inscriptions (Canaanite and Hebrew). Because I am known through my CRYPTCRACKER website, people send me pictures of their prized antiquities, hoping I will be able to read the writing on them. For instance, I have been sent a lot of photographs from a mountain in the Negev desert in Israel, named Har Karkom (Mount Saffron) which is a candidate for being the true Mount Horeb (or Mount Sinai), with a cave on its summit, where Moses and later Elijah (properly Eliyahu, "Yahu is my God") communed with God (full name YHWH). Being conversant with the proto-alphabet I can read the markings on several stones along the track leading to the mountain: they say YH, that is YaHu (as in Hallelu Yah). So the name of the God who was worshiped there is written all over it. Another object that has been brought to my attention is a bronze cup (apparently from the Bronze Age, before 1200 BCE) with a Canaanian inscription, which I see as including the words "bronze cup"; it was found in Jamaica, and this would put the Phoenicians (= Canaanites) in America three thousand (yes, 3000) years before Columbus, and long before the Vikings. Their presence would account for the sudden appearance of writing (logo-syllabic as in the Mediterranean lands), cylinder seals, and pyramids in central America in the Bronze Age. Two inscriptions from a silver mine at Kongsberg in Norway (Viking country!) are also possibly Canaanian. An alphabetic graffito seems to say 'silver mine' (Sh Kh [K] S P); a syllabic inscription says "to be refined" (LA HU ZA QA QI). The Phoenicians certainly circumnavigated Africa around 600 BCE. If anyone tells me that Mediterraneans could not cross the Atlantic Ocean 4000 years ago and meet Mesoamericans, then I simply say that not so long ago two New Zealanders rowed a boat across that stretch of water. And how did the aboriginal people of Australia get to the great south land, aeons ago? But I am supposed to be talking about Philistines, the people who came from the Aegean Sea and settled on the coast of Canaan, and this territory eventually became known as Palestine (named after the Philistines by the Romans). Two inscribed pottery shards from archeological sites in Israel have been published in recent years, and various scholars have been trying to interpret the texts on them. It has occurred to me that both of them might refer to the giant Goliath, and this is not impossible, since one comes from the Philistine town Gath (the hometown of Goliath the Gittite) and the other from Khirbet Qeiyafa (apparently the place called Sha`arayim in the Bible), a fortress overlooking the valley of Elah, where David confronted Goliath. One day, as I was leaving Steve's bulk foods barn on Albert Street in my little city, I met for the first time a man whose story I have been following for many years, namely Ahmed Zaoui (alias Ahmad Zawi). I gave him a Salaam greeting, and in the course of our friendly conversation I told him I was working on ancient documents mentioning Goliath. He has had a David versus Goliath experience in taking on the New Zealand security and immigration authorities (remember, David always wins); if he had been carrying a million dollars to invest in the country he might have been welcomed (truly), but he was put in prison; eventually he was committed to the care of Catholic Christians (and I remember that the Prophet Muhammad enjoyed the hospitality of monks on his caravan expeditions for his employer, his beloved wife Khadijah). Ahmed reminded me that Goliath, as Jâlût, is known in the Islamic tradition. "When they (the Israelites) advanced to meet Jâlût and his forces ... they routed them, by the will of God; and Daud (David) slew Jâlût; and God gave him the kingship and wisdom." I raise up ('rm) the people (`m) of my servant (`bdy) for his virtuous acts (ls.dqtw). Other photographs of the original can be viewed here. Note carefully that there is quite a lot of guesswork in reading the faded ink, and deciding which letters are which; thus there are five examples of 'Aleph (Greek Alpha) with three different shapes or stances, and I will propose elsewhere that here and on other ancient Hebrew inscriptions in the period of the Judges of Israel, early in the Iron Age, each of the 22 letters has three forms (3 x 22 = 66) and three vowels can be expressed (ba, bi, bu, ga, gi, gu, and so on). Thus, at the beginning of line 2 we would have sha-pa-t.a ("he has judged") and at the end shi-pi-t.i ("judgements"). Also, even if my reading of the Hebrew letters is correct, the words are not separated by spaces but run along breathlessly. Various interpretations are possible: the first word could be 'L "god" or "unto " or "not"; if it is 'LT it could mean "goddess" not "cursing" (my choice). 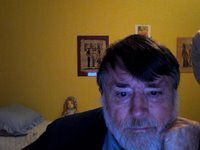 In December 2011, after studying this text for a couple of years, and wondering why the divine name YHWH was missing, I finally realized that the name of God was hiding in the top right corner. My drawing shows a Yod (hand) and reversed E, the sign for the sound /h/, originally representing the head and arms of a person celebrating, and eventually becoming E in the Greek and Roman alphabets). So we have YH, as in Hallelu-Yah, "Celebrate Yah(weh)". The Anaks (`Anaqim) were a 'tribe' of giants in ancient Canaan/Palestine; Joshua had largely exterminated them when the Israelites took over the Promised Land, but some survived in Ashdod, Gaza, and Gath (Joshua 11:21-22), and it has been assumed that Goliath of Gath was one of them. Here we seem to have (according to my interpretation) a record of a message from God (an oracle) through an unnamed prophet. The first line refers to the cursing of the `Anaq or Anakite; Goliath did curse David, when they met (1 Samuel 17:43); and David was known as "my servant" who saved his people from the Philistines and their other enemies (2 Samuel 3:18). Line 2 states that this servant has "judged" someone (meaning that he has caused God's punishment to strike that person), and God himself (YH, in the top right corner) has also judged this Anak. Line 3 shows that this was Goliath (GLYT), and David (DWD) is the servant of God who has defeated him. God speaks in the first person in lines 4 and 5, promising to work together with his servant. The king who is mentioned but not named would be Saul, who was afraid to go out and face Goliath; but here he is raised up and his morale is restored, together with the army of Israel, who pursued the Philistines back to Gath (1 Samuel 17:50-58). Saul became envious of the popularity that David acquired, and made attempts on his life. Psalm 18 is attributed to David, "the servant of the Lord", and said to have been composed at the time "when the Lord delivered him from all his enemies and from Saul". THIS IS THE ONLY MENTION OF DAVID FROM HIS OWN TIME, OUTSIDE THE BIBLE, AND SO IT IS AN IMPORTANT DISCOVERY, ESTABLISHING HIS EXISTENCE, AND ALSO CONFIRMING THE TRUTH OF THE BIBLE STORY ABOUT DAVID AND GOLIATH. "Woe, GLWT; and you have perished. Note this curious detail: the head of Goliath is separated from his body; the G (a boomerang) stands above the L ('supralinear'), not preceding it on the line of script, keeping his head apart from his body, so that they might not be reunited, with the headbone connected to the neckbone, and the giant rearing up on his hindlegs again. Just a passing thought (but I learnt from a Latin teacher at Sydney University in 1954 that a Roman poet did something like that). However, the archaeologists who discovered the document reject the G and the Y as not part of the inscription; they are not actually 'inscribed'; they are not intentional letters but accidental marks (made by plant roots, or the excavater's tools, like the wounds I inflict when I dig up my potatoes with a spade); and the proposed SP is more likely to be another L, and not to be broken up into two parts. 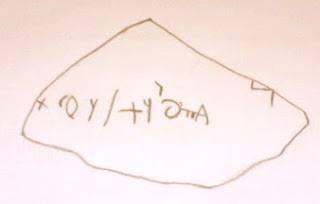 The first of these ('lwt) could be, nevertheless, an original form of the name Goliath, which came out in Hebrew as GLYT (Guliyutu, on the Qeiyafa ostracon). The second (wlt) might be the name of his father. Or the cross-bar in the A-sign could be accidental (it extends to the L) and it is a boomerang, G, hence GLWT . See Michelangelo's painting of David beheading Goliath, in the Sistine Chapel. Phillis Wheatley (1753-1784) an African American poet (the first to be published) composed a heroic poem entitled Goliath of Gath. and all Israel shouted: Goliath is dead."